When my dad was young he joined the Army Air Corps and was trained as a fighter pilot in WWII. Later in life he continued making his living flying airplanes and eventually ended up in the CO Aviation Hall of fame. The first quilt you see is one that I purchased on E-Bay and loved because it reminded me of the first airplane quilt my mom made for him. His comment was “where are the propellers”? 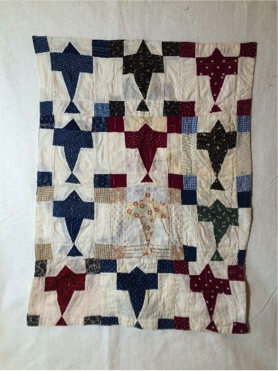 When he was inducted into the Aviation Hall of Fame I decided to make a little quilt for him and it is the one you see next – notice I added propellers. This time his comment was “they are all flying into each other and will crash”! Now he really was not a hard man to get along with, he was just extremely precise and a bit of a perfectionist. He loved to make things out of wood and the pieces that I have from him are beautiful. I guess that’s why I understood his comments. 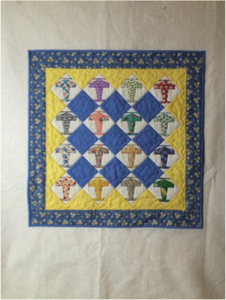 Even though he has been gone now for 19 years, I made one last attempt at an airplane quilt. I called it Planes in Formation and I think he would be proud. The planes are all flying the same way AND they have propellers! 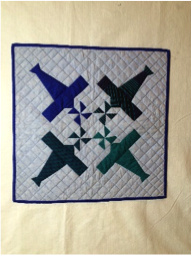 If you would like to make one similar to this, I will be happy to send you the foundation pieced pattern for the 3” airplane block, just email me at [email protected] or you can stop by Wooden Spools to pick up a copy.